Thomas Jefferson once wrote, “No occupation is so delightful to me as the culture of the earth, and no culture comparable to that of the garden.” Herb garden design is perhaps, one of the most delightful activities for the gardener. Whether you have room for only a container, or are blessed with room for raised garden beds, your culinary herbs will delight the senses and give your love for design full expression. The most successful small herb garden designs combine your favorite herbs and flowers in pretty combinations. The photo to the right is an example of a great small herb garden design that is very easy to achieve. 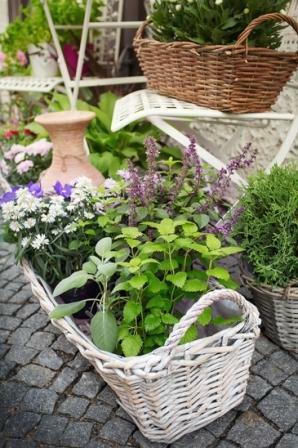 Individual pots of herbs and flowers are grouped together in baskets. The baskets are very effective in providing a cohesive look. The baskets are also portable which is an important design element for a small area since they can be moved when you need to re-purpose the same space. This pretty design is also very flexible, allowing you to bring individual herb pots indoors while cooking or switch out different flowers and herbs depending on the season. Urban homes often have very limited space for gardening. That’s one of the reasons that container herb garden design is thriving in cities. Any apartment with a window that supplies plenty of light, or a balcony that has a sunny spot, can support a container garden. Those containers can be just about anything you want them to be, as long as there are drainage holes in the container. Without drainage holes, water will be retained for too long, causing root rot for your herbs. The design of your container garden will, of course, be based on the type of container you use. Just remember that water runs downhill, so if you tier your gardens allow for controlled runoff. Where will the water go, and what will it take with it? For example, the beautiful strawberry pots are popular with herb gardeners, but, how do you water them? The pockets that circle the pot are hard to water, often overflowing and uprooting the herb in the small space it occupies. The key, here, is to use a piece of 2″ PVC pipe in the center of the planter. Drill holes all around the pipe, for the full length of it, and leave the center clear. Pack dirt around it in the pot. When you water, pour water into the pipe, and it will seep into the soil, watering the plants from the inside out. This type of design helps with watering plants in tall containers of any type. Design your container garden with an eye for diversity. A basket or pot can support 3 or 4 different herbs, and supply plenty of each for most of your cooking needs. Make sure you select herbs with similar light and water needs. Those with limited space outside may be interested in small herb garden design. You don’t need a lot of space for a great garden – all you need is plenty of sun. Most herbs thrive only in full sunlight, although there are some that can handle shade. Some of the prettiest and most bountiful herb gardens are grown in the limited alley space behind a suburban fence. Planting against a fence helps to keep the soil warm, since sunlight reflects light and warmth back onto the garden. Growing along a fence also protects the plants from wind, if that’s a problem in your area.When designing your small herb garden, consider access. If you have access to the plants from all sides, design the tallest plants to be in the middle. If you design your small herb garden with access in mind, you won’t have to reach around taller plants to reach smaller ones. If you are planting your herbs against a fence, plant the taller plants against the fence for the same reason. This not only creates a pretty layering of plants, but it also keeps you from breaking larger plants as you tend to the smaller ones. If you have limited space for your herb garden, consider going “up” to maximize the space. Use a tall container in the center of a round or square area. This will get larger plants up above the garden, leaving more surface area on the ground for other plantings. You can even add more tiers for more planting area. A checkerboard pattern can be used in small gardens. It doesn’t need to be as elaborate as the photo to the right. Four or six squares would still give you plenty of room for several crops. This design would be perfect next to a small seating area where your guests could wander along the walkways admiring your garden crops along the way. Plant taller herbs in the center of each square and add in a few edible flowers for maximum interest. If your available space is long and narrow, consider a trough arrangement. You can often find concrete or stone troughs that are quite attractive and decorative. Place it in the middle of your planting space or along a fence, and plant your tallest, bulkiest plants in this trough. This gets them off of the ground, leaving more ground space for shorter plants. Believe it or not, a metal watering trough from the farm supply store may be just the solution for this elevated planter. While these other designs used raised elements to add volume and space to the herb garden, a true raised herb garden design eliminates a great deal of stooping and bending usually associated with any type of gardening. Lower raised beds are equally good in the garden, especially if you live in an area with rocky or clay soil. Many times a raised garden bed doesn’t add that much in the way of planting space, it just gets the plants up where you can reach them. The one exception is with square foot gardening. Using the square foot gardening approach, here is a space-saving layout for an herb garden. 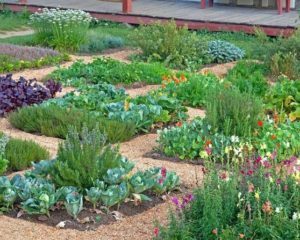 Square foot gardening is a popular method to minimize weeds, conserve water and space while maximizing the yield in your garden. 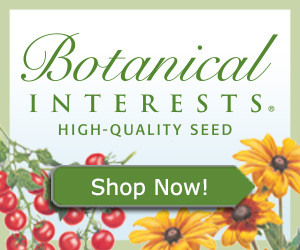 It is widely used in many vegetable and herb growing communities. The square-foot layout is a great way for the very orderly gardener to plant herbs. Ideal for smaller spaces, each square will be designated for a single herb variety. Want to build your own? Here are 6 easy steps to create your own square foot herb garden. Select an area that receives 6-8 hours of sun. Place weed cloth or thick cardboard on the ground to prevent weeds from growing into your herb bed. Build or buy a four-foot square garden box. 6-8 inches deep is perfect. Fill with soil. You can make your own planting soil with equal parts peat, vermiculite, and compost. Add the grid – measured 12 inches apart, you can use twine & a nail or spare pieces of lumber to layout your squares. 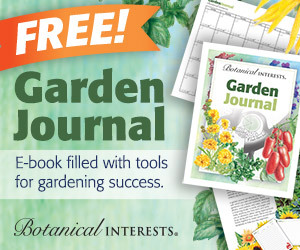 Plant your herbs! Tall ones in the middle & shorter ones along the edges. The white raised garden bed shown below is pre-made kit perfect for the square-foot garden method. This is the 4 x 4-foot size and which is 11 inches deep. We like this planter since it doesn’t require any tools to set up. It is also made from a premium PVC material that won’t rot, fade or wear out over time. Two or more kits can be used if you’d like to add vegetables or create a unique design in your backyard. You may decide to create pathways between each square. These pathways are often handicapped accessible with plenty of room for walking aids or wheelchairs. When designing your own layout, any single planters should be narrow enough so you can easily reach the center of the planter without losing balance – four feet wide is normally a good rule of thumb. The pyramid planter is a fun design which allows you to create several different planting sections. It is visually beautiful while also quite functional, as the design allows you to reach all sections without needing to step into the garden bed itself. This is a truly unique herb garden design that will surely stand out from the crowd. It’s quite big at about 3 feet wide & 2 tall, so you can grow your entire herb garden in this planter. Another popular design for the raised herb garden is the zigzag. It’s especially useful in small yards, where there just isn’t room for a checkerboard. With the zigzag pattern, you still have accessibility and can easily reach the centers of the planters, but the design lends visual interest. Most raised beds feature some type of drainage in the retaining wall. While a weed barrier is often laid on top of the ground, with the raised planter built on top, drainage for these large areas can be a problem. The drainage hole can be as simple as a gap left between two abutting landscaping logs or can be a perforated drain that channels away excess water. If you don’t want to build a raised garden from scratch, you can order a raised garden bed kit. Here are 2 types of raised garden kits which work well for herb gardens. The first is a freestanding version. You can place the VegTrug Raised Garden Planter directly on a patio or deck which is a great way to create an herb garden when space is at a premium. It also is a great solution for anyone with a bad back. The planter box is about 30 inches high, so you won’t have to bend down at all while watering or clipping your fresh herbs. A pre-formed liner and a built in drainage system. This design will maximize your harvest and is easy to maintain and harvest without killing your knees in the process. The second is another good design for small spaces since you can grow vertically. This Tiered Garden Kit is very easy to put together and is made from natural wood with no chemicals added. The stacked design lets you plant several types of herbs and vegetables together in a compact area. Purchasing a raised garden bed kit is a super easy way to start your herb garden without interfering with the rest of your garden landscape. Just locate a corner of your yard that gets great light and is close to the kitchen. Then simply setup your planter, add soil & herbs. Don’t let awkward or limited spaces keep you from developing a great herb garden design. There is always a way to make small spaces work when gardening. Sometimes you just need to be a little creative, then you can enjoy fresh, fragrant herbs year round with your own herb garden.